– 1/4 Longtime boxing judge Gale Van Hoy passed away. – 1/5 WBA orders negotiations to commence between 2 unranked heavyweights, Shannon Briggs & Fres Oquendo for a fight for the WBA world title, which is currently vacant. The winner must then take on the unranked Alexander Ustinov. – 1/16 The Anthony Joshua/Wladimir Klitschko fight has sold over 80,000 tickets, shattering the box office record at Wembley Stadium in London, surpassing Carl Froch’s super middleweight rematch vs George Groves in 2014. – Ring Mag No. 3 and WBA Jr Middleweight Champion Erislandy “The American Dream” Lara made the 4th defense of his title when he stopped unrated Yuri Foreman at 1:47 of the 4th rd on Jan 13th at the Hialeah Park Racing & Casino in Hialeah, Florida. Foreman was down in the 3rd rd & a Lara left uppercut sent Foreman down for the count in the 4th. Lara was off a 12 rd ud over Vanes Martirosyan last May and has now won 7 of 8 including 5 straight. Foreman had won 6 straight with ko’s in 2 of the L/3 after B2B losses in ’10-’11, but the combined record of his foes in that win streak was just 80-59-4 as he was totally undeserving of a title shot. – Ring Mag #7 super middleweight Anthony “The Dog” Dirrell stopped Norbert Nemesapati at 3:00 of the 6th rd on Jan 13th on the Lara/Foreman undercard. The fight was a clear mismatch, dominated by Dirrell with the ref stopping the action. Dirrell has now won 3 straight including his last 2 by stoppage since his 12 rd MD loss to Badou Jack in April ’15. – Ring Mag #3 bantamweight Juan Carlos Payano stopped Isao Gonzalo Carranza at 1:16 of the 7th rd on Jan 13th on the Lara/Foreman undercard. The fight was a mismatch, but this was the 1st fight for Payano since suffering his 1st loss, a 12 rd MD to Rau’Shee Warren last June. 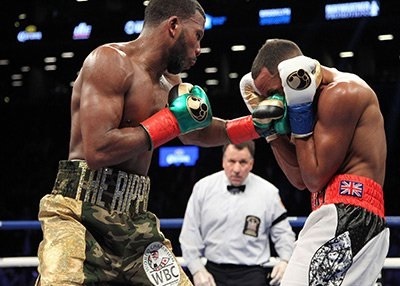 – The vacant Ring Mag Super Middleweight championship remained without an owner as Ring Mag #1 & IBF champ James “Chunky” Degale, making his 3rd defense & Ring Mag #2 & WBC champ Badou Jack, also making his 3rd defense, fought to a 12 rd MD on Jan 14th at the Barclays Center in Brooklyn, NY. Degale scored a flash knockdown in the 1st rd and won many of the early rounds with Jack coming on late and scoring a knockdown in the 12th rd. Degale wanted a rematch to take place in England in the post fight interviews, but Jack wants to go up to 175 pounds. A great fight with a lot of back and forth action. A rematch would be well received. – On the undercard of Jack/Degale, undefeated but unrated Gervonta “Tank” Davis stopped Ring Mag #6 & IBF Jr Lightweight champ Jose “Sniper” Pedraza at 2:36 of the 7th rd to become the 2nd youngest current world champion (WBO Jr Flyweight Kosei Tanaka). Davis landed the clearer & more powerful shots throughout, was never in any real danger & although Pedraza got to his feet, the ref wouldn’t let him continue, in what was a fair stoppage. Davis has 8 straight stoppage wins, but none of the prior 7 had come over a foe that had a combo of DD wins & less than 4 losses. Pedraza, a ’08 Puerto Rican Olympian, was making the 3rd defense of his title. – 1/18 Ring Mag #2 & WBC Super Middleweight champ Badou Jack has informed the WBC that he is vacating the title to move up to the light heavyweight division. The #1 & #2 ranked fighters in the WBC rankings are Ring Mag #6 Callum Smith & #5 Anthony Dirrell and neither have any fights scheduled at this time. – 1/19 Golden Boy Promotions & ESPN enter agreement for a 42 fight deal in the next 2 years. The first card will be on March 23rd. – 1/20 David Haye’s Haymaker Promotions entered into an agreement with Ex Golden Boy Promotions CEO Richard Schaefer to create Haymaker Ringstar Promotions to focus mostly on UK market. – 1/24 Andrzej Wawrzyk, in line to challenge Deontay Wilder for the WBC heavyweight title on Feb 25th, has tested positive for steroids & is off the card. He was a 60:1 ‘dog. – 1/25 Oscar De La Hoya arrested for DUI in Pasadena, Ca. – Ring Mag #1 & WBC strawweight champ Wanheng Menayothin aka Chayaphon Moonsri successfully defended his title for the 6th time with a 12 rd UD over undefeated, but unrated Melvin Jerusalem on Jan 25th at Phitsanuloke Province in Thailand. There were no knockdowns, but Jerusalem had a crucial point deducted in the 8th for a low blow. With no point deduction, the fight would have ended as a majority draw. The undefeated Menayothin has now gone the distance 3 straight fights. Jerusalem had never even fought anyone that had at least 2 wins with less than 4 losses prior to the bout. – 1/26 Golden Boy Promotions $300M lawsuit against Premier Boxing Champions creator Al Haymon dismissed by US District Judge John F. Walker. The lawsuit alleged that Haymon violated antitrust laws & the Muhammad Ali Boxing Reform act. – 1/27 Ring Mag #3 & IBF featherweight champ Lee Selby was due to make his 3rd defense on the Frampton/Santa Cruz undercard against unrated Jonathan Victor Barros, but the fight was cancelled the day prior due to Barros failing to submit his Nevada application and medical records. Selby was off a 12 rd ud over Eric Hunter last April, when he was dropped for the 1st time in his career. Since his lone loss in his 5th fight in ’09, Selby has won 19 straight. 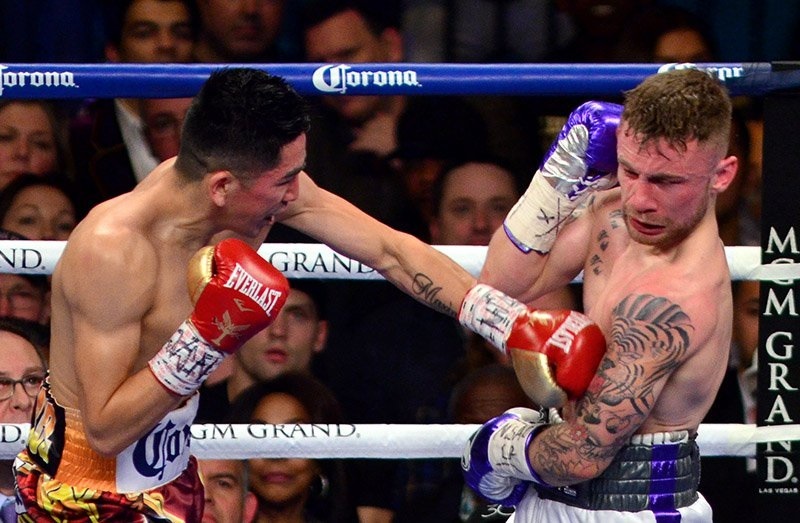 – 2016 “Fighter of the Year,” Ring Mag #10 pound for pound, Ring Mag #2 Featherweight & WBA featherweight champ Carl “The Jackal” Frampton lost a 12 rd majority decision in his 2nd defense against #4 Leo Santa Cruz on Jan 28th at MGM Grand in Las Vegas, NV. There was great back and forth action throughout, but no knockdowns. The fight was an immediate rematch when Frampton won a 12 rd MD last July in a “FOTY” candidate with the 12th rd being a candidate for ‘Round of the year.’ There are already talks of a rubber match to be held in Ireland. 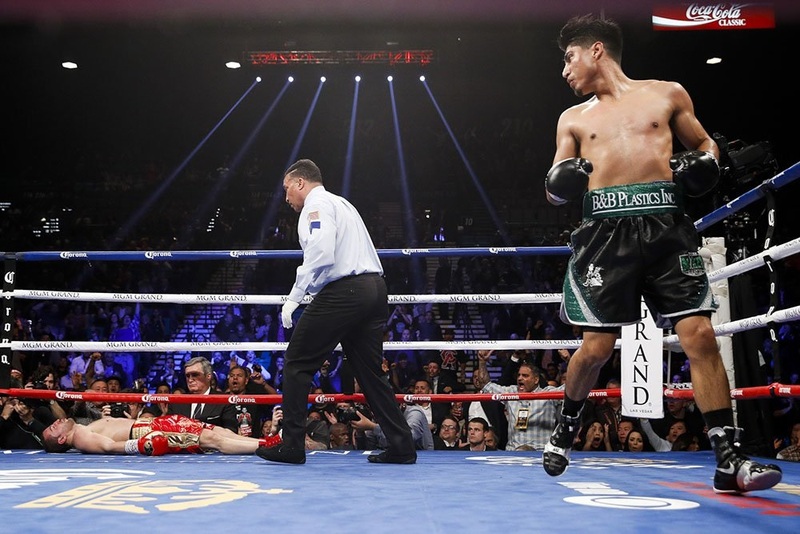 – On the undercard of Frampton/Santa Cruz 2, unrated & undefeated former WBO Featherweight & Jr Lightweight champion Mikey Garcia added his 3rd title in 3 different weight classes by knocking out the undefeated Ring Mag #1 & WBC lightweight champ Dejan Zlaticanin at 2:21 of the 3rd round. Zlaticanin was making his 1st title defense, but was dominated from the outset. The end came after an uppercut sent Zlaticanin forward into the ropes and then upon turning back towards Garcia, an overhand right square to the jaw sent him down and unconscious for several minutes. This is a definite “Knockout of the Year” candidate. This was Garcia’s 2nd fight following a 2.5 year layoff due to management issues. Garcia was a 2:1 fav. 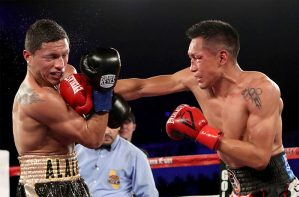 – Unrated Miguel Berchelt stopped Ring Mag #2 & WBC Jr lightweight champ Francisco Vargas at 2:19 of the 11th rd on Jan 28th at the Fantasy Springs Casino in Indio Cali. Vargas, who was making the 2nd defense of his title, was dominated from the outset, taking a beating before referee Raul Caiz Jr jumped in and stopped it. Berchelt has now won 10 in a row since his lone loss in March ’14. He is now due to defend against Takashi Miura, who won an eliminator on the undercard. – On the undercard of Vargas/Berchelt, Ring mag #5 Jr Lightweight Takashi Miura knocked out unrated Miguel Roman at :53 of the 12th rd in a WBC Jr Lightweight eliminator in a fight of the year candidate. Roman was cut above the right eye due to an accidental headbutt. He was in the lead heading into the championship rounds, but was dropped from a body shot near the end of rd 10. He was dropped to his knees from a flurry, then a straight left ended his night in the 12th. This was Miura’s 2nd fight since losing the WBC Jr Lightweight title to the aforementioned Vargas in Nov ’15. He’s now in line to take on Miguel Berchelt for the title. Roman had his 18 fight win streak snapped. – Ring Mag #8 & IBF Jr Bantamweight champ Jerwin Ancajas made the 1st defense of his title by stopping unrated Jose Alfredo Rodriguez in the 7th rd on Jan 29th at Studio City Casino in Macao, China. Rodriguez failed to come out for the 8th, citing a shoulder inj. Andcaja was in command throughout. He’s now won 13 str, 12 by ko. Rodriguez was totally undeserving of a title shot as none of his prior 3 foes had a combined double-digit wins with less than 5 losses.